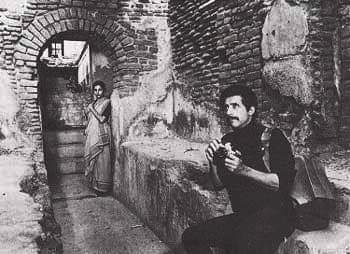 Khandhar was the 22nd feature film Directed by Mrinal Sen and released in 1984. The movie won India’s National film award for Best Direction, Best Actress and Best Editing. It was screened in many international film festivals and has won accolades all over the world. Ruins (Khandhar) of old palaces, fortresses, mansions etc have provided the grand setting to several iconic movies. This is one among the best. Mrinal Sen will go on living through his work. Along with Ritwik Ghatak and Satyajit Ray, he has taken Bengali cinema to envious heights. Novelty seeker Dipu (Pankaj Kapur) invites his friends Subhash (Naseeruddin Shah) and Anil (Annu Kapoor) to his dilapidated ancestral home in the country. The story revolves around the three days they spend there in the company of the caretaker and his daughter. The only other occupants are a mother (Gita Sen) and her daughter named Jamini (Shabana Azmi), who are left with nowhere else to go. The name Jamini is one that stays in your mind for long and enjoys a soothing Bengali tone to go with it. Director Mrinal Sen has tried to use the innate nature of the actors while choosing them for the roles. The casting is excellent. Naseeruddin Shah playing a creative person, Pankaj Kapur as a practical man, restless Annu Kapoor and demure Shabana all seem natural for the role. Though this may be due to the superior acting prowess of the cast, I would rather give credit to the director for giving the right role to the right man. Naseeruddin Shah speaks volumes with his eyes and poise. The grace and charm of a genuinely passionate photographer are on display. Shabana Azmi, almost becomes one with the surroundings and has the difficult emotional scenes to take care of. 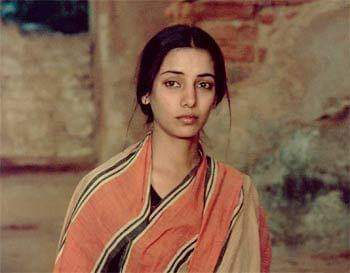 Surrounded by rot and decay, and with gloomy looking clothes to wear, Shabana still looks beautiful and more so when shades of hope flashes in her eyes. 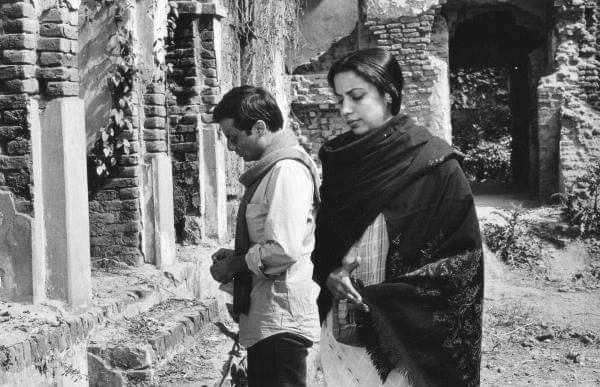 Without taking anything away from Shabana, I think Deepti Naval would also have played the role well. Young men on vacation and cooking for themselves have been portrayed with honesty (especially the effervescent Annu Kapoor). The natural sounds and background music are delightful and credit goes to Bhaskar Chandavarkar. Two occasions came to notice where there was a sudden jump from one scene to the next which was agreeably interesting. Mrinmoy Chakraborty has added creative elements through editing. The ruins are first depicted in the shadows of night and this seems to be a pattern in many great movies. Then the morning is revealed with how the sun, mist and dew work together in unravelling the mysteries behind the tall, unstable structures and strange corners. As this photographer’s paradise evolves into noon, the darkest nooks are brought to light. The light captured and camera angles are commendable for which credits are due for K.K.Mahajan. The wreckage is just the canvas on which the seven characters are let loose and it is they who stay in your minds long after the movie is over. Natural acting, light, sounds and the directors’ own script tie it all up with the house in ruins. World-class movies need all departments to pull their weight together and this is a true case in point with Director Mrinal Sen at the helm. Photographs from a vacation may sit and stare at you from the walls as you slowly get busy in your daily life. We take time to visit ruins of the land, but what about those of the heart!